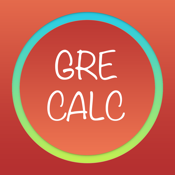 GRE Calculator is for students preparing to give the GRE exam. 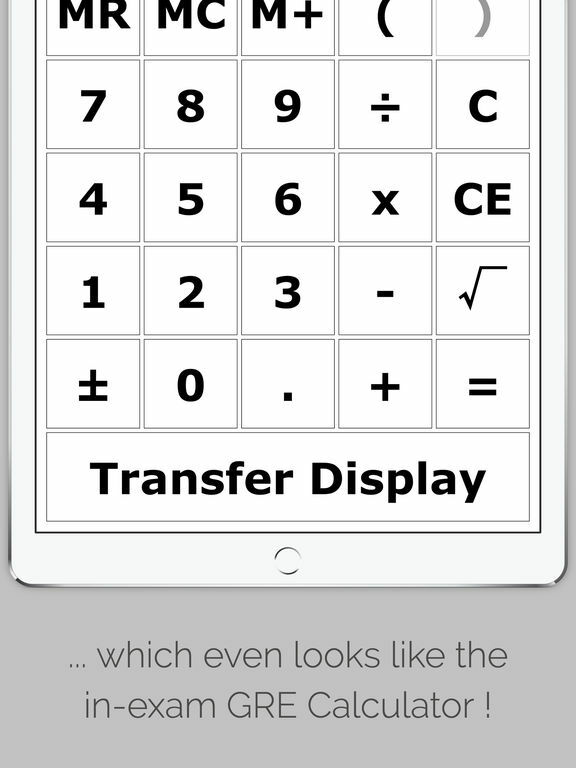 The calculator offered here is one that's very similar to the one offered during a GRE exam's Quantitative section, because it follows the same operational restrictions. Other generic calculators aren't tailored specifically for GRE exam practice, which is why using them for practice isn't recommended because it gives students unrealistic expectations of what to expect during an actual GRE exam. 1) No exponent notations are used or allowed. 2) Use of parenthesis is allowed only to a single degree (i.e. nested parenthesis isn't allowed). 3) Any number with an absolute value larger than 99,999,999 is not displayed, and instead the phrase "Error" is displayed. 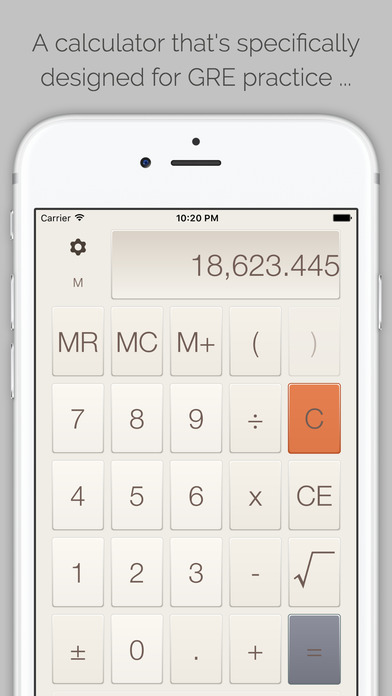 4) At any time, no more than 8 digits are shown on the screen. Rounding off is used where needed to meet this requirement. 5) Any computation performed that is mathematically undefined, results in the "Error" message being displayed. 6) The only memory functions allowed are MR, M+ and MC. 7) Complex numbers aren't allowed. 8) Mathematical 'order of operations' is enforced. For example, if calculating 8 + 5 x 3 from left to right, the answer would be 23, not 39. GRE Calculator also offers a style called 'GRE Exam Style', which makes the calculator look strikingly similar to the calculator offered during an actual GRE exam. 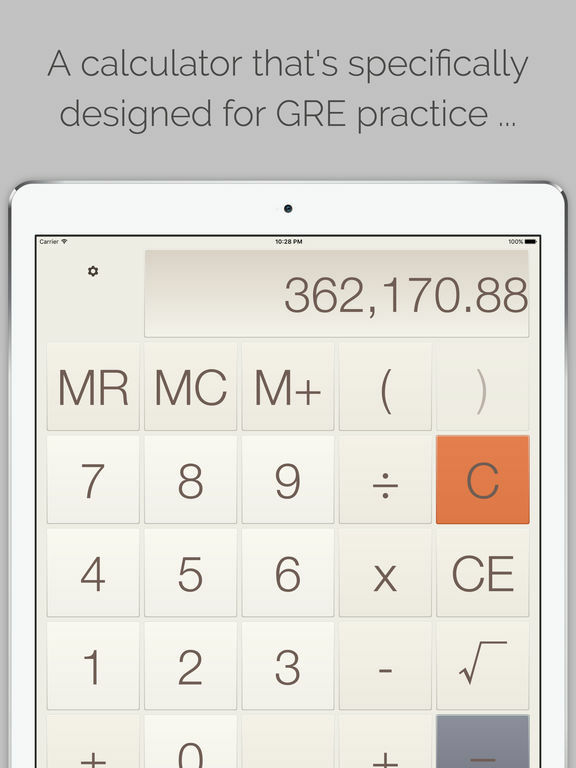 This offers an even more realistic practice experience for all those using GRE Calculator.